“Human influence on the climate system is clear” was the key message from the report on the physical science of climate change from the Intergovernmental Panel on Climate Change (IPCC). In the fifth report, this message is heightened. Since the 1950’s many of the changes observed and analysed in this report have been unprecedented including warming of the atmosphere and ocean, diminishing amounts of snow and ice, rising sea levels, and increases in the concentrations of greenhouse gases. With 259 lead authors citing 9200 papers in the report, two thirds of which have been published since 2007, the fifth assessment presents a strong message to policymakers across the world. Incredibly, this feat of scientific work has been approved and agreed upon by 110 governments across the world, with 1089 reviewers consisting of scientists, the public and governments from 55 of those countries offering a staggering 54,677 comments on the physical science basis report. Almost every word was commented on, disputed and discussed to come up with 18 headline messages – a first for the IPCC reports – that stated in simple language the report’s key outcomes. “If you look at temperature, it is red” stated Stocker in a press conference, describing one of several key images from the IPCC policymaker summary. 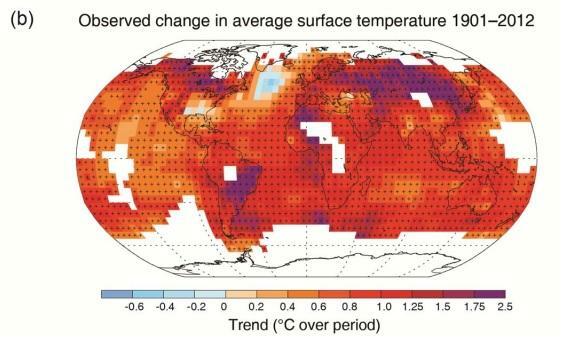 Observed change in average surface temperature 1901-2012 from IPCC Working Group I summary for policymakers (SPM 28). This simple statement with clever wordplay not only elicits a global increase in surface temperature but also danger. Our planet is warming, and humans are the culprit. He goes on to say “…each of the last three decades has been successively warmer at the Earth’s surface than any preceding decade since 1850…Global surface temperature change for the end of the 21st century is likely to exceed 1.5°C relative to 1850 to 1900 for all RCP scenarios.” RCP stands for representative concentration pathways, four greenhouse gas concentration trajectory models used by the IPCC in its fifth report. “In the Northern Hemisphere, 1983–2012 was likely the warmest 30-year period of the last 1400 years.” For the fifth assessment the IPCC have gone to great lengths not only to ensure consistency and reliability in scientific data and consensus, but also to outline the key points from their summary for policymakers: the use of simple language to describe the data that does not include hype or headlines but instead simple scientific language. The report also highlights the increase in global mean sea level rise, with a key headline stating “…the rate of sea level rise since the mid-19th century has been larger than the mean rate during the previous two millennia (high confidence). Over the period 1901–2010, global mean sea level rose by 0.19 [0.17 to 0.21] m”. 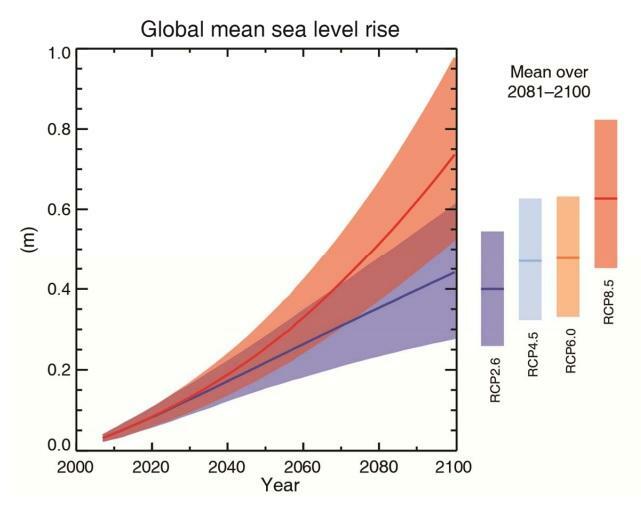 Global mean sea level rise from IPCC Working Group I summary for policymakers (SPM 35). In each of the IPCC’s four RCPs it was clear that the higher the cumulative carbon emissions, the warmer it gets. 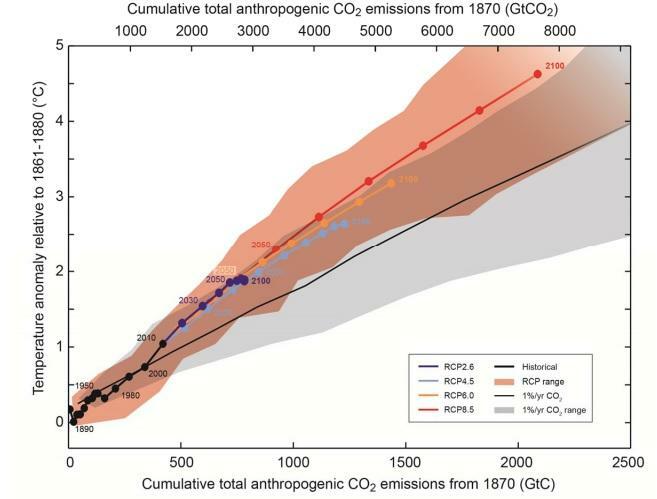 Cumulative total anthropogenic CO2 emissions from 1870 (GtCO2 ) from IPCC Working Group I summary for policymakers (SPM 36). Global average surface temperature change estimated from present to 2100 (°C), from IPCC Working Group I summary for policymakers (SPM 33). In some ways, the outcomes of this report are a repetition of what the public have already been hearing: humans are influencing climate change. But what is crucial to note about this 5th assessment report is the huge consensus among scientists, public and governments about this statement. “This is not about ideology, this is not about self-interest” was a quote from Achim Steiner, the head of the UN’s environment programme, UNEP – a comment that will resonate with many through the ‘unequivocal’ status of the report’s conclusions – and a statement that Stocker echoed later “it threatens our planet, our only home,” clearly urging policymakers across the globe to take combined action on climate change.